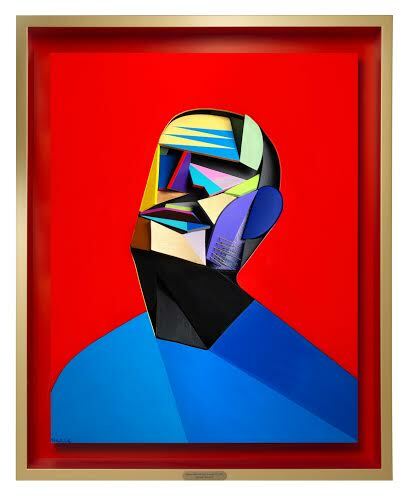 Between 2nd and 31st October 2015 a comprehensive exhibition of “Dimensional Paintings” by Adam Neate will be presented at Elms Lesters Painting Rooms, London. I asked Adam some questions, here are his answers. OvG: I have been following your career since 2008, and have always been amazed how much ‘soul’ you are able to put into your work. Is it correct that your earlier work – the works you left on the streets and the first gallery pieces – was all about imagery and less about material and technique? 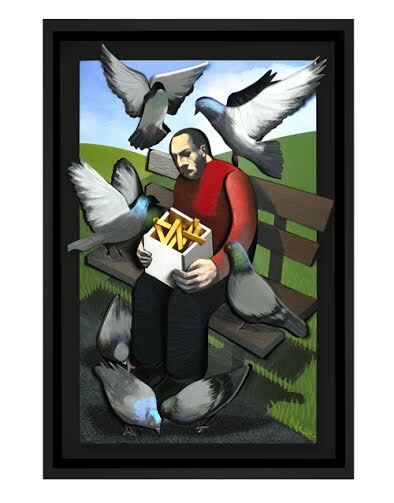 AN: My street pieces were kind of like my art education. I experimented with colour, form, materials, techniques, compositions, styles etc. The main aim was to try to not repeat the same style and re-invent yourself as often as possible. OvG: Your early work was ‘one dimensional’. Then you moved on to three dimensional works such as Red Icon, then to four dimensional works: have you found your final style – sculpted paintings? Or is your path leading somewhere else? A short documentary filmed and edited by Steven Williams. 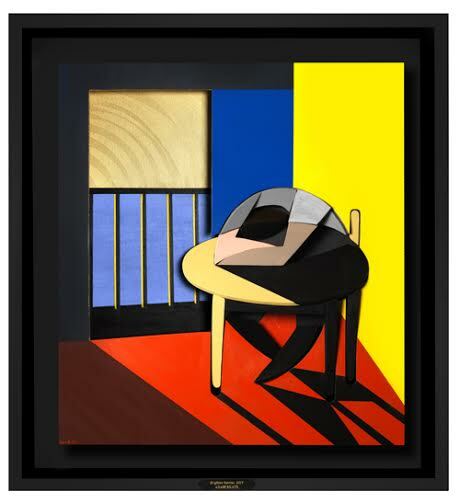 The exhibition DIMENSIONALISM' by Adam Neate, was held at Elms Lesters Painting Rooms, London between 5th September and 18th October 2014. AN: The main reason I make art is for that moment of creativity, when that new idea comes out of nowhere (giving birth to something). That is my core foundation to it all. Kind of like a work mantra for myself for the reason to keep going with what I am doing. With learning to paint in a new language like I am doing, it is spurring me on to take new paths in order to purposefully search out and make new discoveries with in what I am doing. OvG: Your work is all about human communication, relationships, family, loneliness, la condition humaine, but also religious symbols (crucifixes, icons) play an important role. How come you suddenly painted bright yellow flowers? Are you too happy? AN: With any new language of painting, to truly try and master/conquer the form, the painter must try and create his or her own world with in their language. Take for example the Cubists, who would go from painting still lifes with violins and newspapers to Catalan landscape scenes. Even though a vase of flowers may sound simplistic there is a naturalistic urge to look back at what has come before us like the classic still life scene and for us to try and re-interpret it today. I paint most of my paintings outdoors and when I was painting the flower painting a bee came to sit on one of the flowers to try and extract pollen. It was such a strong experience for me I was glad I chose to create the piece for that reason. OvG: I once read that your wife Waleska, graffiti artist Daze and Pablo Picasso are your main inspirations. Did you consciously avoid the name of Francis Bacon, or was that because you got fed up constantly being compared to him? AN: I'm honored to be compared to Francis Bacon, but apart from the subject of a portrait and use of expressionism, the similarities stop there for me. I think people like to pigeon hole things to give them a sense of understanding for themselves, by taking what they themselves know and think as the closest comparison. Way before Francis Bacon there was Umberto Boccioni. My number one influence is Picasso. 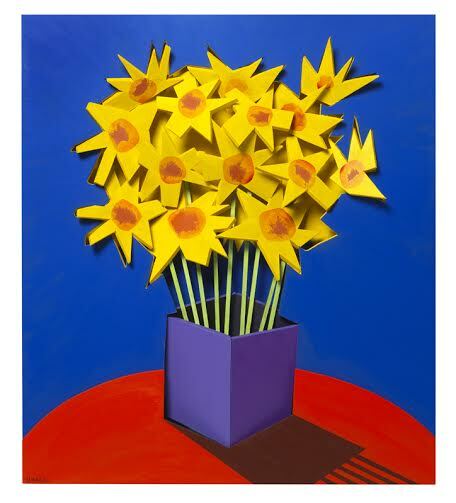 Picasso outshines everyone just from his body of work alone and second place is David Hockney. OvG: You work with Elms Lesters, a gallery – run by two amazing people, Paul and Fiona, who have dedicated their lives promoting your work, and they do so brilliantly and untiringly - that represents only one artist: you. How does that feel? It must be totally flattering but quite a responsibility too. A: It is great fun, I am beyond lucky to have them to work with and am super blessed to have that responsibility bestowed upon me. OvG: Can you tell me some more about the news works in the show? I have seen five images, and those works feel on the one hand familiar (man and table, human face) and on the other hand very ‘new’ (flowers). Again, it’s all about dimensionalism: combining different materials, different dimensions and angles, striking colors. Can you shine some light? A: I keep lots of sketch books for ideas and compositions dotted around my house and workplace and one in the glove box of my car. So every time I have an idea, I sketch it down. It's kind of like having a fuzzy memory of events and ideas stored on to paper. Sometimes an idea sticks in my head and I repeat it various times throughout different sketch books. Then after time the strongest ideas and compositions keep coming back until I decide to create it into a reality. So this show is more or less the best realities of my expanded fuzzy memory. Check out the website of Elms Lesters for more information about the exhibition. 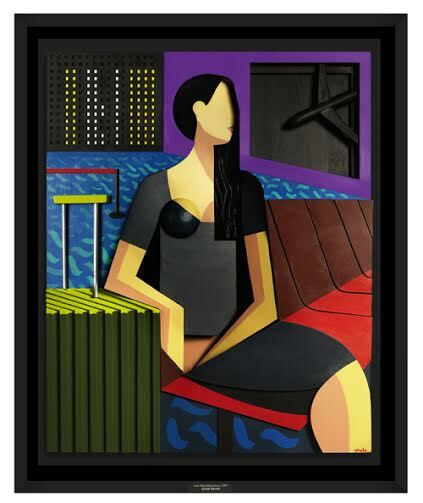 Here's an interview with Adam Neate. Now go and see the show!